As usual Hong Kong Phooey messes things up but luckily Spot is there to save the day. Congratulations. 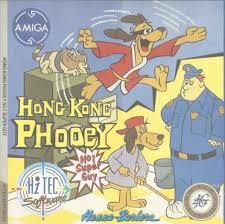 Hong Kong Phooey is a beat 'em up game for the Amiga and other home computers released in 1990 and possibly only in Europe. It was based on the Hanna-Barbera TV series of the same name. The jump animation is non-existent, and the jump-kick doesn't count. Even Super Mario Bros., made on an 8-bit system, had jump animations! The enemies are generic, robotic, and lacking any sort of character or difference, like in the NES Ninja Turtles game, despite that some throw daggers. The ending is seriously anti-climactic. You don't even get to fight the last boss (a giant guy holding a rocket launcher who just stands there doing nothing, not even moving, or a a giant monster with a massive bazooka﻿ on the Amstrad CPC version). If you try to attack him or even just touch him the screen goes black and shows a picture of Spot the cat (Hong Kong Phooey's sidekick from the cartoon) along with this message: "As usual Hong Kong Phooey messes things up but luckily Spot is there to save the day. Congratulations.". That's the end of the game. It's as if the game was unfinished, but got released for some strange reason.